As we reflect on our most recent challenge at sea, Rachel is in Burlington defending her Ph.D. thesis, Caitlin and Jason are both starting new jobs, and Tara & Chad are beginning construction of a new home. We recognize the challenges they face are far greater than those we are contending with. We are so proud of each of them. 40 knots of wind and large swells. Given that water everywhere in Chetumal Bay is “skinny” we found ourselves in a precarious position. The anchor dragged for 20-30 yards before resetting but put us in only 7’ of water. 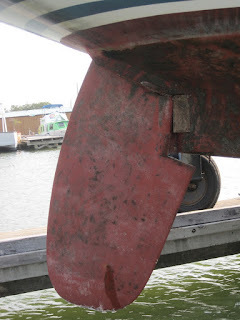 With the swells building, the wind howling, and rain beating, our rudder and keel banged repeatedly on the bottom. Needless to say, 35,000 pounds of boat striking bottom was a jarring experience. Damage to the rudder stock made moving the rudder impossible. Tony risked life and limb in his dinghy to help us attempt to advance the boat by setting a second anchor and pulling forward. After an hour the squall subsided and the next morning, Argosea towed us into 10’ of water where we sat for days trying to figure out how to deal with the situation. The dilemma is simple to describe but complicated to solve. We were on a boat that could not be steered in a very remote part of a developing country where no services were available to help. Communication by cell phone, internet or satellite phone was extremely limited and we realized how isolated we really were. In addition, we were physically in Belize since it was on the route to Chetumal where we planned to officially checkout of Mexico. The next days only served to illuminate just how difficult our problem was and how challenging it would be to solve. Our saving grace was that we were sailing with our friends Tony and Anne on Argosea, a 47-foot Moody. Day two of the ordeal was spent at anchor in Sarteneja where we found a wifi cafe so we could contact our insurance broker to get the wheels rolling. We were assigned a surveyor, Bill Casey, from Fort Lauderdale who quickly became the primary resource person for our rescue plan. His efforts on our behalf have been exceptional and we are most grateful for his support, reassurance, and advice. It soon became apparent that there was no way to move the rudder into a neutral position or to obtain repairs. 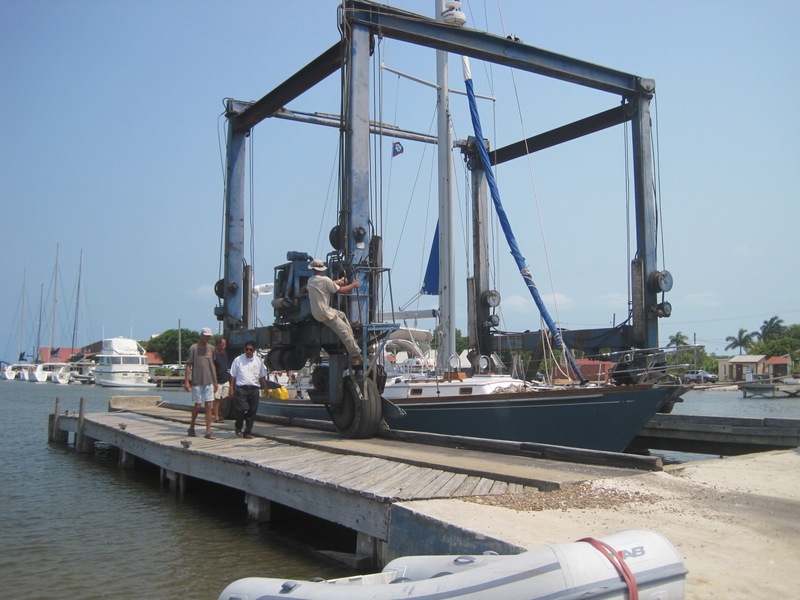 The only travel lift in all of Belize is located at Cucumber Beach Marina in Belize City, 90 miles away. Bill contacted dive boat companies, sport fisherman, commercial fisherman, and the Coast Guard to no avail. 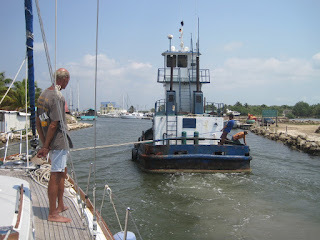 On Saturday, with no other option, a towline was connected to Argosea and off we went toward Nesting Bird Cay. Towing on the hip turned out to be too risky for the boats and we decided that unless there was dead calm, it would no longer be an option. Sunday we decided to stay put at anchor and develop a new plan. A Belize Coast Guard boat was dispatched to assist us. 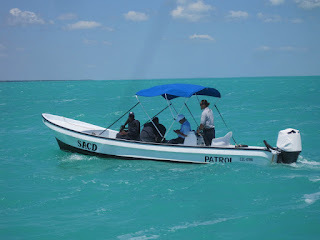 The Belize CG arrived in a small dory powered by single small outboard. They had more firepower in their automatic weapons then they did horsepower on their boat. They informed us that they could not be of assistance since we were .5 miles into Mexican waters. We pulled anchor and Argosea towed us a mile into Belize waters but the CG then informed us that they could not help anyway. Frustrated, Argosea resumed towing us. Although Atalanta pulled hard to port, Argosea was able to maintain a heading and stay in the 10’ deep channel. We motored the entire afternoon at the blazing fast speed of . . . 2 knots. At sunset, we anchored in open water and settled in for the night. The four of us shared dinner and we enjoyed their company immensely despite the fact that all of our nerves were frayed. With Bob’s support, a tug was finally located and hired to tow us the rest of the way to Belize City. We waited another day, anchored in shallow but open waters, for the Henry Travis to arrive for the journey that would take 12 hours and cost $14,500.00 USD. Ouch! By 10 PM we were just offshore from Belize City. A larger tug arrived to take us to an anchorage for the night where we bounced in strong winds and moderate seas. After yet another sleepless night, the George Two arrived for our final tow down a very narrow entrance into Cucumber Beach Marina. 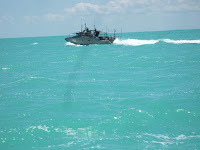 The 3000hp tug skillfully guided us between two rocky breakwaters before leaving us right in front of the lifting well. In the next bit of good fortune, we hooked up with Pico, a Swiss expat who shipwrecked in Belize 20 years ago and never left. He assessed our damage, met with Bill who arrived from Florida, and developed a plan that we have been systematically working on. As of May 14th, the rudder is removed and ready repair at a Mennonite community in central Belize. The 20º bend in the rudder stock needs to be pressed and straightened, the shaft re-rounded, and a bit of fiberglass repair on the hull completed. 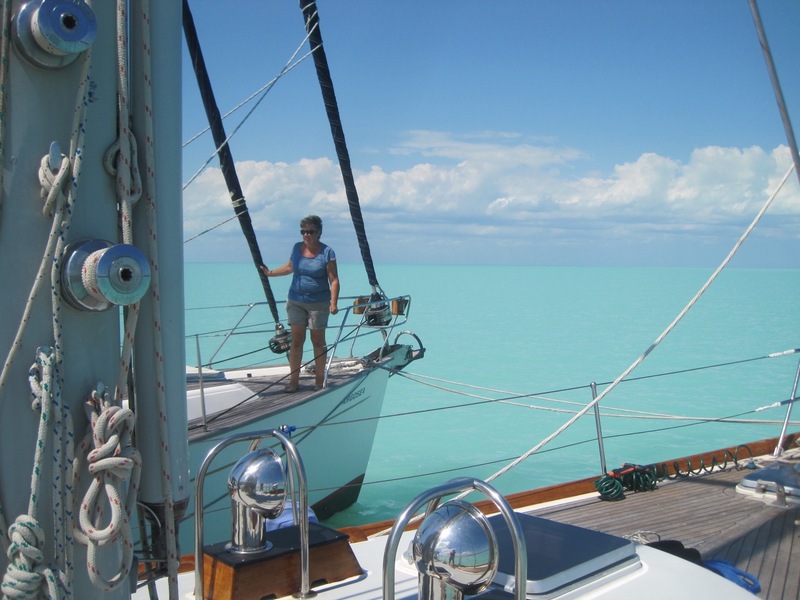 We found that Belize has very limited services and supports for cruising sailors. 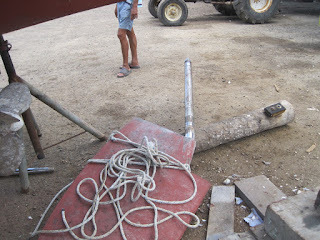 Nevertheless, everyone at the boat yard is knowledgeable, friendly, and helpful. Hopefully, in a week’s time we will be repaired and ready to move south. And we remain grateful to each and every person who provided us assistance. Glad that everything is on the mend! Well-written account, Richard & Kay, so many thanks for sharing your adventure with us. Not an experience you long for.